Apple CEO Tim Cook met with senator Orrin Hatch (R-Utah) on Friday afternoon to discuss topics like technology and economy, reports BuzzFeed. Hatch, who is a member of the Judiciary Committee and leads the Senate Republican High-Tech Task Force, has met with Cook several times in the past and participated in Apple's ongoing encryption debate with the U.S. government, calling for a private Senate briefing with Apple attorney Ted Olson following the dismissal of the San Bernardino case. During Friday's meeting, Hatch told BuzzFeed he and Cook talked about ways to grow the economy and the technology industry. They also spoke about Cook's trip to Utah in October, where Cook took part in a privacy-related Q&A session hosted by Hatch. 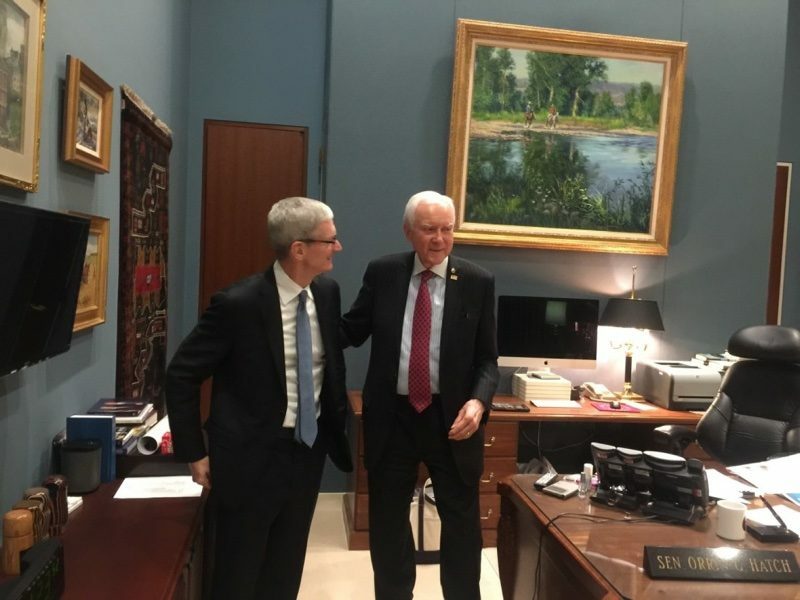 "During today's meeting with Apple CEO Tim Cook, we discussed ways to grow the economy and our tech industry, as well as his recent visit with me in Utah," Sen. Hatch said in an statement to BuzzFeed News. "Given the issues I work on as chairman of the Senate Republican High-Tech Task Force, it's especially useful to listen to innovators like Tim." Cook, along with Apple's vice president of environment, policy, and social initiatives Lisa Jackson, also had dinner with Ivanka Trump and her husband, Jared Kushner, on Thursday evening. They dined at Italian restaurant Tosca, located near the White House, but it's not clear what was discussed. Cook's meetings with Hatch, Trump, and Kushner follow a December tech summit that saw Cook and other leaders like Amazon CEO Jeff Bezos, Microsoft CEO Satya Nadella, IBM CEO Ginny Rometty, and Tesla CEO Elon Musk meet with U.S. President Donald Trump to discuss topics like trade, immigration, and vocational education. At the time, Cook told Apple employees he attended the tech summit with Trump because Apple plans to continue to focus on key areas like privacy, security, education, human rights, and combating climate change. "Personally, I've never found being on the sideline a successful place to be," he said. "The way that you influence these issues is to be in the arena." God forbid Tim meets with successful businessmen who love the United States. Get back to me when he loves ALL of the United States, and not just the white, male, Christian portions who live in states that voted for him. What is his hand doing? I'm sorry but the more Cook gets cozy with Trump and his kids, the less I want to buy any more Apple products. I don't know, I'm totally consumed by that painting being crooked. Probably just distortion from the curvature of the camera lens but it's really bothering me. edit: it's the lens, the top of the door appears slanted too. Still bothers me though. The sooner the government updates 15 year old technology, the sooner they understand the fights tech and internet have. "15 year old"? that's their newer stuff. Lots of "Crooked" things in that office, the painting is among the least egregious. Brazilian born/American citizen, gay atheist here who voted for Trump. Don't generalize buddy. Not all of us non white, minorities are into playing the victim card. Is that another alternative fact? We don't really know whether Trump is objectively successful - he refused to release his tax returns, unlike every other presidential candidate for the last umpity years (he made all sorts of excuses, but we still don't have them). We know he talks endlessly about how successful he is, but that's not really worth much. The same guy who wouldn't believe President Obama was born in the US even after being shown all sorts of official proof... and to prove he's a great businessman, all we've got is his tweets about how he's definitely the best and smartest businessman evar, and his name on a bunch of things many of which he doesn't own.